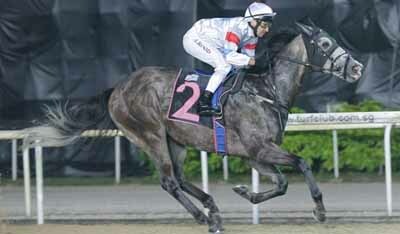 KRATOS resumed from a spell and immediately got back to winning ways in the Kranji Stakes C event here tonight. The New Zealand gelding scored back-to-back wins last August and September, also from spell, and was sent for a let-up after a second placing in Class 3 in October. Michael Rodd, who rode KRATOS last start, was back in the saddle tonight and made no mistake this time, timing his run to perfection to win by 1 1/2 lengths. It was the fourth in 10 starts for the four-year-old who has have a sto-start career since making his debut in April 2016. KRATOS was the middle leg of a splendid hat-trick for Rodd who climbed to the top of the jockey's table after his superb showing. The Aussie's two other winners were SMART VINTAGE and ARR FLAIR. The evening's races started with a big shock when KING OF THIEVES showed a reversal of form to take the opening to pay $600. The six-year-old had finished dead last in his last three starts this season and his only previous win came in January 2016.